Rega's Record Store Day turntable will be signed by Elbow, Noel Gallagher and others | What Hi-Fi? Rega has revealed that one in ten of the limited-edition decks will be signed by stars including Jarvis Cocker, Elbow and Noel Gallagher. Rega has released some more details about its limited-edition Record Store Day turntable. It previously announced that the deck - a hybrid of the Planar 1 and RP3 - will be signed by a host of famous musical faces. And now we know who. The full list is as follows: Elbow, Jarvis Cocker, Kasabian, Kate Nash, Noel Gallagher, Peter Hook, Placebo, Public Service Broadcasting, Slaves and The Pretty Things. However, not every turntable will be signed. Only one in ten will bear a signature of one of the above. These will be allocated at random to independent record shops around the UK. 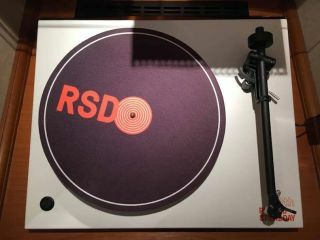 The limited-edition turntable was produced to celebrate the tenth anniversary of Record Store Day. Costing £250, it will only be available from Rega stockists and independent record shops from Record Store Day on Sunday 22nd April. "It is a privilege for Rega Research to be involved with Record Store Day and to contribute to the future viability of bricks and mortar record stores for dedicated crate diggers and music fans alike," said Paul Darwin, UK sales director at Rega Research. "This is the third year Record Store Day has partnered with Rega Research, and it's a no-brainer to continue the partnership for our tenth anniversary," said Alex Jordan, owner of the Reflex Record shop in Newcastle. "Rega's independent heritage is a natural fit for Record Store Day and the ethos of independent record shops up and down the country. "We are really excited to give our customers the opportunity to own a special piece of kit with the added excitement of possibly finding a limited signed one too."